Stay in the tracks, it’s the only way to make it through! Drama unfolded over the past week as a rarely seen natural phenomenon occurred over much of the British Isles. It was so cold that rain actually froze and fell to earth in flakes of snow; something that has not been seen since way back. Last year sometime. But we can’t say we weren’t warned. Weather forecasters informed us of impending doom. We should only travel “if absolutely necessary”. As a result, countless people decided against partaking in their evening hobby of driving around aimlessly in circles. It was just too dangerous. Then the heavens opened and the snow cometh. Parts of the west experienced blizzards with gusts up to 5mph, resulting in drifts capable of obscuring predatory polar bears, quite possibly looking for new territory due to the melting ice cap, attracted by the ‘arctic’ conditions. Understandably, faced with such dangers, schools closed. Just in case. 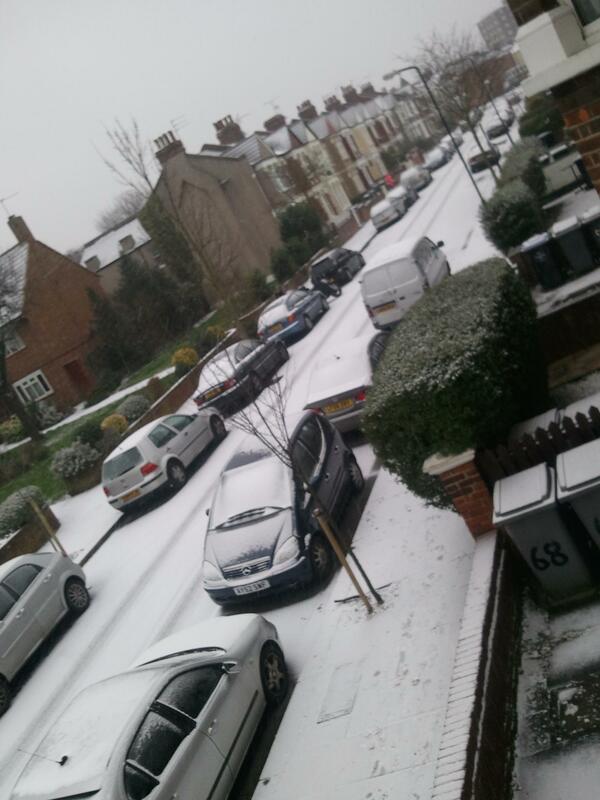 London received a fair dusting, resulting in travel chaos. Commuters were forced to either stay in bed work from home or face delays of up to 10 minutes. How utterly inconvenient for such busy people. By Sunday, parts of the capital had been blanketed with several centimetres more snow, bringing the depth to just over ankle height. The dwarf community were advised to stay indoors. An albino couple were subjected to an unpleasant exorcism by a local priest who thought he was witnessing disembodied Timberland jackets wandering through Clapham. In Mayfair, police were searching for a missing Chihuahua that was sent for help after it’s owner lodged her Porsche Cayenne on a large snowman, unaware of how to select 4×4 transmission. After surveying the situation, her Ugg boots soaked up moisture from the snow and froze, thereby forcing her motionless, unable to life her heavy feet. Thankfully, most people heeded advice and stayed indoors. In the first extreme weather event since the ‘drought’ of last summer that caused office workers concerns over ‘rehydration’, the authorities eventually managed to take control of the situation, ensuring casualties were low. Thank God we made it through. The British are such a stoic bunch. Well done each and every one of you, and thanks be to the authorities and media, without whom we just wouldn’t have known how to cope. Anyone want to buy a freeze-packed Chihuahua? Keep the Chihuahua in the freezer. Best place for it. That poor baby (I mean the Chihuahua – I am the proud Mommy to one “Chi” myself). We live in the Great Smokey Mountains of Tennessee, a place where you would think, I mean, common sense would almost dictate that there would be snow in the winter time. Alas, we have had only 3 inches! I happen to adore snow, cold weather in general. Give me blankets, hot chocolate with a shot of Kamora, and a couch or bed to snuggle up with my husband and my dog – and the world is peachy no matter what it looks like outside the window. I can relate to the womans Uggs too. Last week we were flooded out of our home when the river rose 4 feet, and I had to swim for it fully dressed. Holding the dog in my arms, of course. My Uggs were naturally soaked through (and through! ), but they sure did help to keep my feet warm enough to not freeze when I was in the water. Chihuahuas are just not great rescue dogs I guess, but I admire you persisting with keeping one, with your snow, floods and smoke problems. As a Brit currently living in Salzburg (with a view of the Alps from my busstop), my perspective on the snow issue has shifted quite a bit recently. This was hilarious. 2 feet of snow made my bus on time, rather than the 3 minutes early that I’ve come to expect. The city’s going to pot, believe me. Just as well. Now the snow has melted there are dangerous puddles here.